“In the Heights” is all about getting a break, or getting another chance. And so is “In the Heights” at San Diego City College. By opening auditions to the community at large, director June Richards and co-director/choreographer Alicia Rincon assembled a cast of newbies and more experienced talent. Some are in the Theater Department at the College. Some have never been onstage before. Some have come back after years away. And many have harrowing life stories of their own, which mimic the immigrant experience of this exuberant hip hop musical about a tight-knit multi-cultural community that’s about to be dismantled. It’s also about being true to yourself, your family and your culture – and finding the meaning of ‘Home.’ The highly-touted creation of Lin-Manuel Miranda, with book by acclaimed playwright Quiara Alegria Hudes, won four Tony Awards in 2008, including Best Musical and Best Score. As might be expected, this production is a mixed bag: among a cast of 33, there’s at least one terrific hop hop dancer (Bernadette Ondevilla), and a few powerful singers. Wilford Paloma is likable and charismatic as the centerpiece of this Washington Heights, NY, barrio story, Usnavi (named for the U.S. Navy banner on a passing ship). As the girl-who-made-good, earning a scholarship to Stanford, then failing to make the grade, Erika Osuna has a lovely voice and a pleasing presence. The 12-piece band, under the baton of music director Michael Farley, keeps the pace brisk and bouncy. But opening night, there were sound problems; only some performers were miked, and many couldn’t be heard, often rendering Miranda’s clever lyrics indecipherable. Despite its unevenness, though, what sets this production apart is that it’s so obviously filled with a sense of community, commitment and heart. 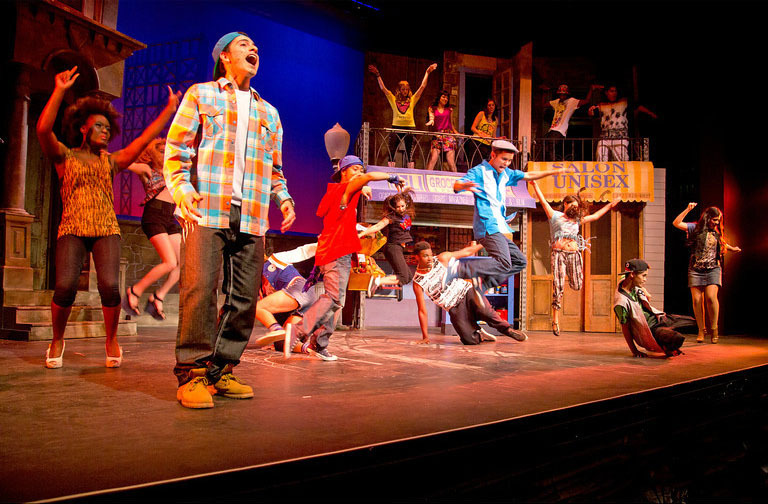 “In the Heights” runs through April 27 in the Saville Theatre on the campus of San Diego City College, at the corner of 14th and C Streets, downtown. Performances are Friday and Saturday at 8 p.m.; Sunday at 2 p.m.